5-CD box (LP-size) with 82-page book, 148 tracks. Playing time approx. 380 mns. In the 1950s, a quartet from Memphis, Tennessee changed the face of American gospel music. They brought the excitement and passion of gospel to millions, finding a huge national following for white Southern gospel music. Young Elvis Presley had his heart set on joining, and was a regular backstage visitor. They were The Blackwood Brothers. For the first fifteen years, the Blackwood Brothers travelled to small town church concerts, got up early for local radio shows, and sold songbooks out of the trunk of their car. Then, in 1950 they moved to Memphis, and suddenly things began to change. Their music was infused with a new energy, influenced by the Memphis scene of blues, jazz, R&B, and black gospel. They went where no white quartet had gone before. The Blackwoods took songs at the fastest tempo, and always had the hottest piano player. They had the most animated stage act, jumping around, bending over backwards, throwing the microphone stand back and forth. They had the most daring, the most complex, and most unique arrangements, often ending on breathtaking high sustained harmonies. They also had the most diverse repertoire, drawing from the rich heritage of black gospel music They sounded like no other group in music, and created a style that was the Blackwood Brothers. 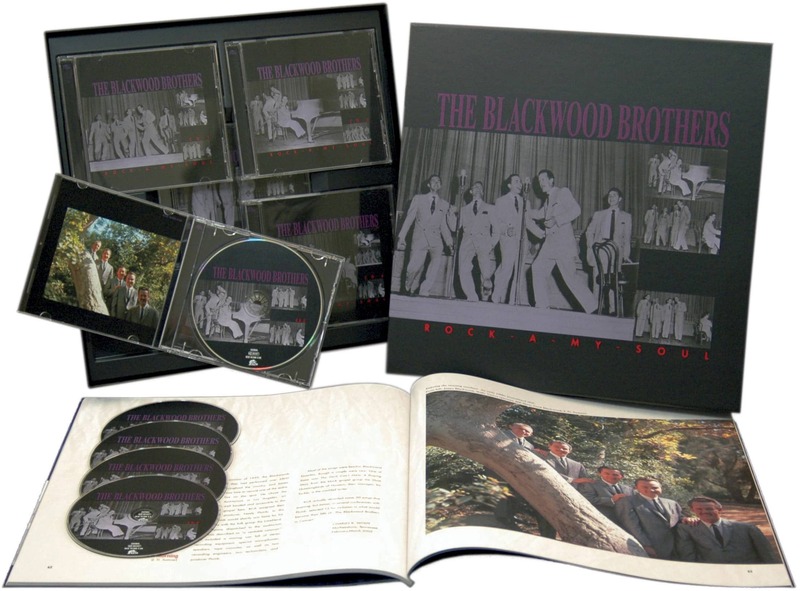 This set comprises the Blackwoods' complete Victor recordings from 1952 to 1959, and includes all-time favorites like Rock-a-My Soul, It Is No Secret, Mansion Over the Hilltop, Swing Down Chariot, Take My Hand Precious Lord, My God Is Real, His Hand in Mine, How Great Thou Art and other songs later popularized by Elvis Presley. 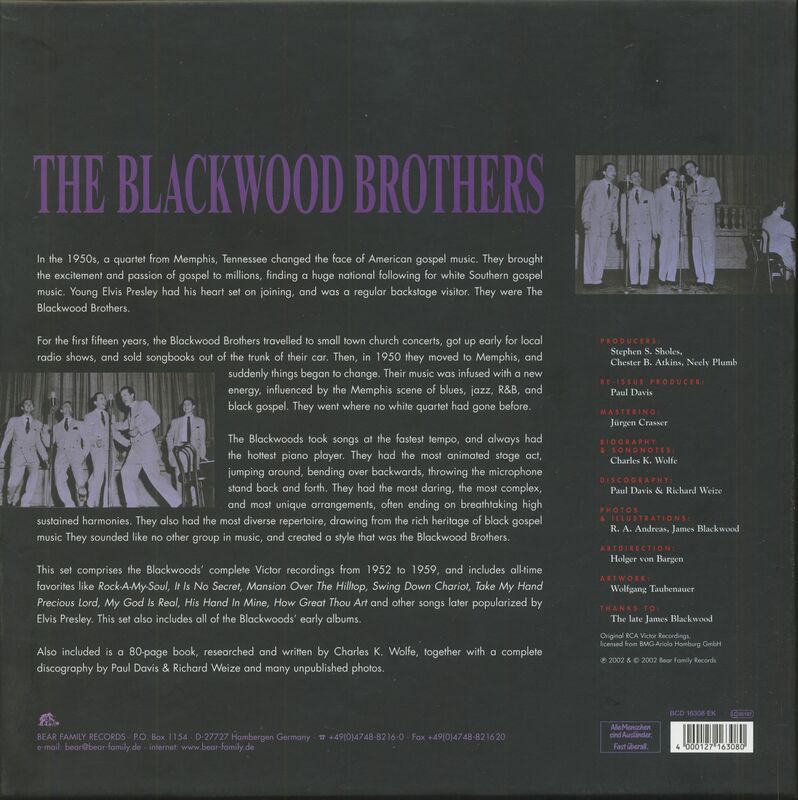 This set also includes all of the Blackwoods' early albums. Also included is a 82-page book, researched and written by Charles K. Wolfe, together with a complete discography by Paul Davis & Richard Weize and many unpublished photos. 27 Do You Know It Jesus? 03 Do You Go To Church? 12 Shall I Crucify Him? 14 Do You Know My Jesus? 15 Do You Go To Church? In the 1950s, a quartet of young men from Memphis, Tennessee, changed the face of American gospel music. With their superb musical skills and revolutionary promotional techniques, they brought the excitement and passion of gospel to millions of fans who had thought of it as stodgy church music and sanctimonious funeral hymns. They took what had been a niche music for working-class southerners and broke it out to a huge national audience. And though they were by no means the first classic gospel quartet -- "four men and a piano" -- they were certainly the most colorful and the most famous. Young Elvis Presley had his heart set on joining them, and was a regular backstage visitor to their concerts at Municipal Auditorium in downtown Memphis. All the major gospel songwriters, both white and black, sent their songs to them. Major record companies, which had largely ignored gospel music, courted them with contracts, and even national network television shows sought them as guests. By the end of the decade, as country singer Barbara Mandrell has said, it was impossible to think of gospel music without thinking of them. Their name was The Blackwood Brothers. For the first fifteen years of their career, the Blackwood Brothers were not all that different from the hundreds of other well-mannered happy little gospel groups that populated the South in those days. They travelled to small town church concerts, got up early for local radio shows, and sold songbooks out of the trunk of their car. Then, in 1950 they moved from their conservative Iowa base to the bustling musical melange of Memphis, and suddenly things began to change. Their music was injected with a new energy, and the Memphis scene of blues, jazz, rhythm and blues, and black gospel had the effect of supercharging the group and blasting it off into a territory where few quartets had gone before. The Blackwoods of the early 1950s had the highest tenor, and -- especially after J.D. Sumner joined up -- the lowest bass in gospel. They took songs at the fastest tempo, and always had the hottest piano player. They had the most colorful and animated stage act, jumping around, bending over backwards, throwing the old mike and its stand back and forth like a military drill team. They had the most daring, the most complex, and most unique arrangements, often ending on breathtaking high sustained harmonies. They also had the most diverse repertoire, drawing especially from the rich heritage of black gospel music, 'whitenizing' the arrangements in the same way young rockers like Elvis would do a few years later. They also had an amazing battery of singing styles; sometimes they sounded like the Golden Gates, at other times like the Mills Brothers; sometimes they resembled the old Stamps Quartet of the 1920s, and at other times the stately, mellow sound of Frank Stamps’ Dallas radio quartet; sometimes they resembled the Pilgrim Travellers, or the Soul Stirrers, or the Dixie Hummingbirds, and at other the Ames Brothers or the Four Lads. 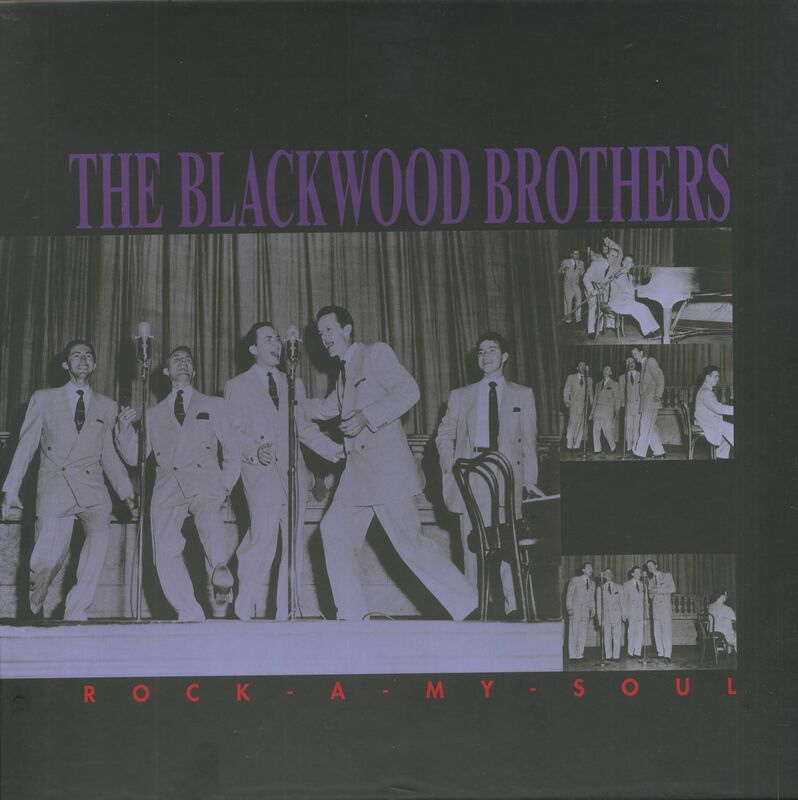 And then there were many times when they sounded like no other group in music, and created a sound that was -- the Blackwood Brothers. Symbolically, the story of the group that was to dominate twentieth century southern gospel music itself began on the first year of the new century, on a cold Christmas Eve in the Mississippi delta. There, in a sharecropper's shack, Carrie Prewitt Blackwood, wife of William Emmett Blackwood, gave birth to her first child. A local doctor named Thomas had been summoned, and after several hours behind the bedroom door, he emerged to tell Emmett the good news: wife and son were fine. Weak with relief, the new father announced the boy would be named Roy. Emmett and Carrie often attended the local church singings and brush arbor meetings. James remembered years later: "I can see her now. After doing the breakfast dishes and sweeping the floor she would make the beds. Then she would get her Bible and go down by the garden fence. There she would kneel and open her Bible and read from it. Then usually she would sing Fanny Crosby's 'Close to Thee' or the Ira Sankey type standard 'Oh, How I Love Jesus.' Then she would pray." The family continued to grow. A sister, Lena, was born in 1905, followed by another boy, Doyle, in 1911. The family seemed complete, and at a brush arbor meeting in Fentress, Mississippi, in 1918, Carrie Blackwood came forward and was saved. The whole family soon found themselves at singing conventions, revivals, and all manner of local religious services. Then, surprisingly, nineteen years after her last child, a fourth was born in 1919. He was to be named James, and with his birth, the three original brothers who would found the quartet were in place. The first of the brothers to get serious about music was the oldest, Roy; at the very same meeting where his mother got salvation, Roy got the call to become a minister. He already had the reputation as a good singer. He recalled years later that friends and neighbors often complimented him on his work. "From their compliments, it suddenly dawned on me that I could sing. That I had the gift of phrasing and singing style proper for delivery of Christ's message in the beloved gospel songs." In the meantime, Roy married in 1919, to a local girl named Susan Hall. Soon they had started their own family, with the birth of R.W. in 1921, and the birth of a second son, Cecil, in 1934. Thus R.W. had an uncle, James, who was only two years older than himself. With R.W., the fourth member of the original quartet was in place. Though Roy was devoted to the classic church hymnody of the time, his younger brother Doyle was becoming more interested in the new hillbilly and gospel music he was hearing on radio and records. By the early 1920s the James D. Vaughan company of Lawrenceburg, Tennessee, was spreading its new, lively, up-beat quartet music all over the South. He had his own record companies, and his quartets were being heard on stations from Birmingham and Nashville; the quartets were also touring the country in snappy convertible cars with the name 'Vaughan Quartet' written on the side. Though their main job was to sell songbooks to churches and singing conventions, more and more fans were getting interested in the quartet style itself, and were eager to become audiences in churches as the quartets put on a fast-moving, professional show. For a young teenager like Doyle, it was amazing. "My first and everlasting ambition," he recalled, "was to learn everything possible about singing, and then to become a professional Gospel singer." Doyle first attempted to play the fiddle, and when that turned out to be frustrating, he switched to mandolin and guitar -- better instruments to accompany vocals. He absorbed the records of Alabama's leading duet, the Delmore Brothers, and the Grand Ole Opry's harmony trio, the Vagabonds, as well as Mississippi's own blue yodeller, Jimmie Rodgers. "I'll tell you," he remembered, "every possum, rabbit, squirrel, and skunk for miles around our place became quite aware of the entire Jimmie Rodgers repertoire." Sometime around 1926 Doyle and his kid brother James began singing around the house informally, and finally got up enough courage to go out in public and sing at local church programs and school 'exhibitions.' James recalled that they won "a whole back seat full of groceries" at the first contest they entered. A little later they were asked to sing at an all-day singing in Jackson, Mississippi; they did, though James (barely seven) had to stand on a chair to be seen by the audience. They were such a hit that the manager of the local radio station WTJS invited them to come down and repeat their program on the air. It was the duo's introduction to performing on live radio. Back then, local singing schools were the preferred way of learning the 'rudiments' of gospel singing. Singing school teachers, often under the auspices of one of the many seven-shape note gospel songbook publishers, would come into a community and teach short courses in harmony, meter, pitch, intonation, and sight-reading. It provided the only way that many southern singers got any formal musical training, and major country singers like A. P. Carter, Bill Monroe, and the Delmore Brothers attended such schools. When James was about ten years old they heard that a person was going to be teaching such a singing school at the Clear Springs Baptist Church, about three miles from their home. (In 1923 their family had moved to a farm near Ackerman, Mississippi, in Chocktaw County.) The tuition fee was three dollars each for the ten nights but their hardworking parents were too poor to be able to afford the six dollars for the two boys. On hearing her two boys discussing their disappointment at not being able to go, their mother secretly sold some of her chickens and gave the surprised boys their tuition. Customer evaluation for "Rock-A-My-Soul (5-CD)"